California Democratic Congressman Adam Schiff is scheduled to make an appearance at a popular breakfast event in New Hampshire that's frequently attended by presidential aspirants, although the congressman has given almost no indication at this point if he's interested in running in 2020. Schiff is now chairman of the influential House Intelligence Committee, and while ranking member of that committee in the last two years, used that perch to boost his name recognition by making hundreds of television appearances commenting on issues related to the numerous Russia investigations. President Trump tweeted about Schiff last November in the dustup over the appointment of Matthew Whitaker as acting attorney general of the Department of Justice. "So funny to see little Adam Schitt (D-CA) talking about the fact that Acting Attorney General Matt Whitaker was not approved by the Senate, but not mentioning the fact that Bob Mueller (who is highly conflicted) was not approved by the Senate!" Trump tweeted on Nov. 18. Another sign of Schiff's increased visibility of late would be the hefty increase in donations to his leadership PAC, a legal campaign-finance vehicle that can help a politician pay for ulterior items such as travel to events, polling, message testing with focus groups, and more. In the six election cycles prior to 2018, Schiff's leadership PAC took in a grand total of over $289,000. In the 2018 cycle, the same PAC took in $654,000, more than double all the other cycles combined. The latest campaign finance data aggregated by the Center for Responsive Politics shows the PAC has just over $50,000 cash on hand. In early 2018, the Republican National Committee took aim at Schiff's newfound TV popularity. "Rep. Adam Schiff has used the House's Russia investigation as his big break, becoming a near constant presence on cable TV to raise his profile," the RNC said in a statement. "From January 23, 2017 until February 25, 2018, Rep. Schiff, the Ranking Member of the House Permanent Select Committee on Intelligence, participated in a whopping 227 television interviews, clocking a cumulative total of 26 hours, 4 minutes, and 10 seconds on television." The RNC went on to compare that to Schiff's time speaking on the House floor, saying those speeches numbered "10 times for a total of 36 minutes, and 29 seconds." "It's clear that Schiff, who recently had no national profile, has used the House's Russia investigation as a self-serving platform to increase his visibility and is incentivized to prolong, dramatize, and overhype the investigation so he can continue preening for the cameras," the RNC concluded. 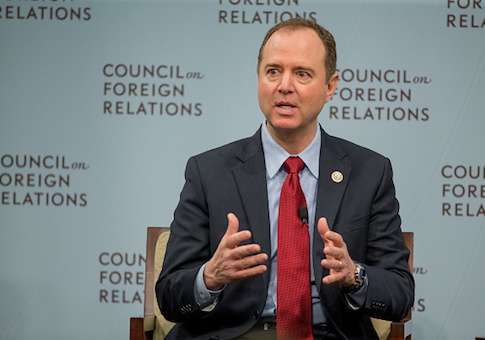 Schiff "will be the featured speaker in the next installment of the ‘Politics & Eggs' breakfast hosted by The New England Council and the New Hampshire Institute of Politics at Saint Anselm College," the Washington Examiner reported. "The event is scheduled for Feb. 4." Recently, Schiff's Facebook and Twitter accounts have been paying for promoted tweets and ads. Those expenses are being paid for by the congressman's "hard money" campaign account, Adam Schiff for Congress, even though the congressman was easily reelected just two and a half months ago. Another California congressman and colleague on the House Intelligence Committee, Eric Swalwell, is also thought to be interested in the Democratic 2020 nomination for president. This entry was posted in National Security and tagged Adam Schiff. Bookmark the permalink.